Uttarakhand Open University adheres to the guidelines of the Government of India as communicated by the MHRD and the UGC with respect to the upliftment of the students and employees belonging to the SC/ST/OBC & Women categories. To this end, Uttarakhand Open University has created an Equal Opportunity Section to look after, the various matters related to different sections of the society. 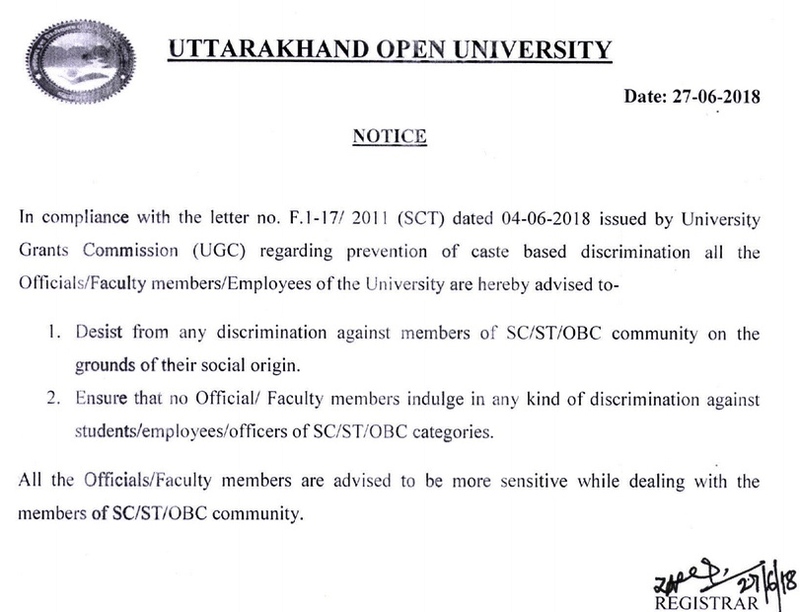 A committee comprising of following members is hereby constituted to look in to the grievances, if any, of students and staff related to discrimination on the basis of caste etc. The main function of the cell is to solve the grievances of SC/ST/OBC and women students and employee & render them necessary help in solving their problems. The committee will suggest the remedial measures as per rule in such grievances to Vice Chancellor Uttarakhand Open University and it will also suggest measures to prevent such activities in the University.